TOKYO (AP) -- Although he’s behind one of the biggest fashion brands to come out of Japan, Issey Miyake detests being called a fashion designer. Maybe a designer, even a sculptor, but not that frivolous, trend-watching, conspicuous consumption known as fashion. What he has pursued since he started in the 1970s is more timeless. His down-to-earth clothing is meant to celebrate the human body. And it’s anyone’s or everyone’s body -- any race, build, size or age. “The work of Miyake Issey,” at the National Art Center in Tokyo, is a moving journey through his creative mind. The show includes his signature pleats that transform usually crass polyester into chic. 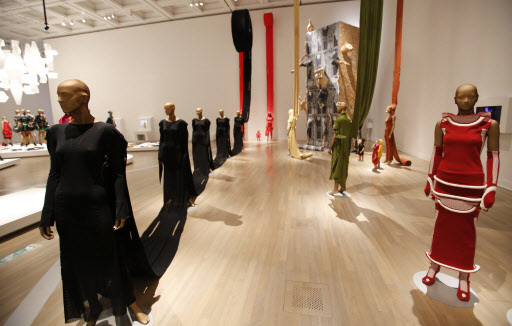 In another corner, mannequins are connected by a roll of fabric to highlight his A-POC, or “a piece of cloth,” series that began in 1998. A-POC uses computer technology in weaving to create apparel at the same time fabric is being produced. Again and again, the exhibit drives home Miyake’s basic concept of a single piece of cloth, be it draped, folded, cut or wrapped, but he does not see the exhibit as a “retrospective,” says Midori Kitamura, president of Miyake Design Studio and the exhibit’s producer. One stark piece aptly called “colombe,” or “dove,” is rectangular, white monofilament fiber resembling soft plastic. It doesn’t use a single stitch but snaps on in a brushstroke of a swirl. Miyake has taken inspiration from a variety of cultures and societal motifs, as well as everyday items -- plastic, rattan, “washi” paper, jute, horsehair, foil, yarn, batik, indigo dyes, wiring. The exhibit starts with a row of figures donning his early but already powerful works. A jersey body-wear evokes tattooing with images of Jimi Hendrix and Janis Joplin, who died in 1970, the year it was created. His collaboration with Japanese painter Tadanori Yokoo depicts monkeys and foliage in vibrant psychedelic hues on a flowing robe. Another poignant part of the exhibit highlights the pleated Olympic uniforms for various countries designed by Miyake. In 1992, he was commissioned to design the official uniform for Lithuania, which had just gained independence from the Soviet Union. Miyake got Japanese material maker Toray to provide the fabric, Japanese sporting goods company Mizuno to handle the production and Polytex of Thailand to do the pleating. Ten more uniforms were created by Miyake in the 1990s, and another 10 for the current exhibit. “Issey Miyake’s garments of his entire career have been displayed in the grand setting of the National Art Center, Tokyo, as innovative works of art, as they deserve to be,” said John Carpenter, curator of Japanese art at the Metropolitan Museum of Art in New York, who saw the exhibit during a recent visit to Tokyo. “The imaginative exhibition design and abstract sculptured mannequins by Tokujin Yoshioka add another brilliant artistic dimension,” Carpenter added, referring to the figures wearing the clothes at the exhibit that are artworks in themselves. Over the years, Miyake has shown a knack for collaborating with people outside his genre, such as designer Yoshioka, furniture and interior designer Shiro Kuramata, photographer Irving Penn, choreographer and director Maurice Bejart, pottery-maker Lucie Rie, Ballet Frankfurt and the gymnastics team of Aomori University in northern Japan. Born in Hiroshima in 1938, Miyake was a star as soon as he hit the European runways. His brown top, which combined the Japanese sewn fabric called “sashiko” with raw silk knit, was splashed on the cover of the September 1973 issue of Elle magazine. Miyake was also a pioneer in gender roles, asking feminist Fusae Ichikawa in the 1970s, when she was in her 80s, to be his model, sending the message that garments must be comfortable and express the natural beauty of real people. Miyake’s approach so brings the spiritual to the mundane question of what to wear, one even wonders if it might free one’s soul, bringing to mind the elements, like water, fire, air and the earth, at once futuristic high-tech and handmade primordial. But Miyake avoids the trap of getting pretentious. One great look he approves of is the T-shirt and jeans. The exhibit includes his version of the gorgeously faded pair of jeans. Benjamin Lee, a Tokyo-based photographer who has taken Miyake’s portrait as well as those of writer Haruki Murakami and visual artist Yayoi Kusama, believes Miyake is a true innovator, creating art works with clothes. Yet he exuded warmth in person and they laughed together, Lee recalled. “I was left with the impression of meeting someone special, who understood people very well, and how fashion can make everyday living more interesting and comfortable,” he said. “The work of Miyake Issey” runs through June 13. His office says overseas exhibitions have not been decided.